Can you believe the Big Game Day is this Sunday? Does that freak you out a little? ‘Cause it’s definitely freaking ME out! Where is the year going? Didn’t we just pop open bottles of champagne to celebrate New Year’s Eve? Now the big football day is getting closer, friends will start arriving (and inevitably making you wonder WHY OH WHY did you decide to host the party this year?) and you have nothing prepared. SO MUCH STRESS! Gaaaaaaaaaaaah!!!!! ??? Let me go ahead and tell you: stressing out, threatening to divorce your husband for inviting 20 people over for the Big Sunday and locking yourself in the bathroom during the whole party so nobody realizes there’s no food other than those sad, boring bagged snacks that your (soon to be ex) husband got at the gas station -> BAD CALL! The good call? DIGIORNO® Pizza, of course! Yep, you can calm down now, sister. Everything is okay! All you have to do is get a few varieties of DIGIORNO®, bake them and enjoy your time with your friends and family. 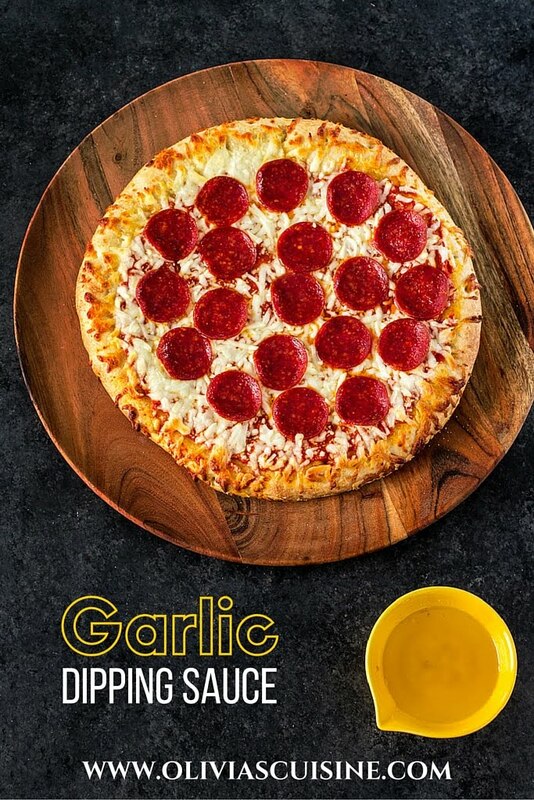 The pizza is delicious on its own, but I went ahead and made a Roasted Garlic Dipping Sauce that is a breeze to make. Just so you can feel better about not having to lift a finger (ok, except preheating the oven and getting the pizza on and off the oven) to feed your guests! To make the garlic dipping sauce, all you gotta do is roast a whole head of garlic in the oven and then pop it in the food processor with a stick of butter. Once everything is smooth, melt it in a saucepan or in the microwave and serve! DIGIORNO® Original Rising Crust® pizza is always my first choice when I’m buying frozen pizza. These folks put a lot into crafting each pizza to ensure it bakes up hot and fresh right in your own oven. And the best part? It’s ready to be enjoyed in about 20 minutes! I also love their sense of humor! Have you seen their funny “Typical Game Day Party Guests” commercials starring linebacker Clay Matthews and some social media stars like DeStorm Power, Colleeen Evans (I love her videos!) and Ray William Johnson? I thought they were clever and a hilarious look at how to #maketherightcall at game day gatherings. Being a blogger myself, I gotta give it to them to feature some social media folks! Way to go, DIGIORNO®! ? Truth be told, commercials are my favorite part of the Big Game Day. So I’m looking forward to seeing some fun ones this Sunday! And to eating pizza, of course. Smothered in Roasted Garlic Dipping Sauce! Because who doesn’t love garlic butter? Needless to mention, this sauce is also great for breadsticks and for steak. ? I hope you guys enjoy it and that your football Sunday is awesome! Peel most of the paper off the garlic and trim about 1/4 inch off the top of the head to expose the tops of the garlic cloves. Drizzle with olive oil and season with salt and pepper. Wrap it in foil and roast in the oven for about 40 minutes or until deeply golden and soft. It may take longer than 40 minutes, depending on size and age. Press on the bottom of the cloves to push the garlic out of its paper and transfer to a food processor. Add the butter and process until smooth. Transfer to a saucepan (or bowl in the microwave) and melt, skimming the excess fat (foam) if desired. If you want, run the sauce through a strainer before serving. Serve with your favorite DIGIORNO® pizza! Roasted garlic is just a magical thing isn’t it?? Gah I love how buttery it gets! I bet this is so good with the pizza!! All the hype and work to make this awesome sauce perfect. The last thing I’ll ever do is serve it with a frozen pizza! I’m making some Dough!